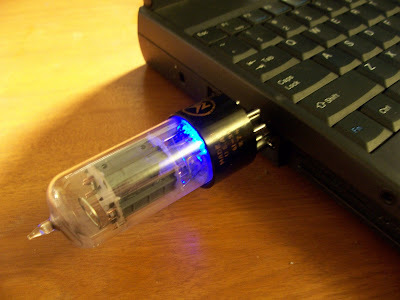 A steam punk idea I have been kicking around for a while, This prototype is a two gig usb drive inside of a vacuum tube I believe from an old TV set with of course a blue LED in the base to give it that special blue tube look when it is in use. I have stored hours of "OTR" Old Time Radio mp3 shows on it like Doc Savage, Tarzan, and X-Minus 1. The next one I build will have a flavor of Linux installed in it so it will be able to boot up my operating system from a single vacuum tube not like the computers from the past that used hundreds of vacuum tubes to operate them. 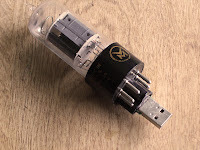 It took two tubes and one usb drive to construct this working usb drive in a vacuum tube. Remember in stream punk electronics we never wont to let the steam out.